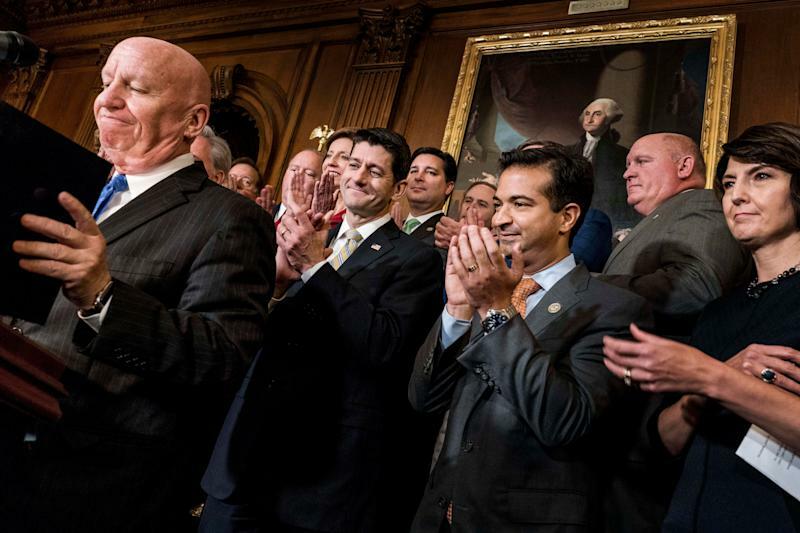 Speaker of the House Paul Ryan, along with his leadership, celebrate passing the House tax bill. WASHINGTON ― A little-noticed provision in theRepublican tax reform bill that passed the Houseon Thursday could have a big impact on affordable housing construction. The House bill maintains a tax subsidy for low-income housing construction, but ends the tax-free status of certain bonds that builders rely on to arrange financing. Developers say the mere threat of the policy change already has them scrambling to close deals for upcoming projects before the end of the year, when funding could disappear. Chris Akbari, president the Itex Group, a development company in Texas, said his firm is in the process of closing a $49 million deal to buy and rehabilitate a low-income apartment complex in Houston. “We might not be able to close in time,” Akbari said. The tax subsidy is one of several seemingly random items targeted in the House tax plan, such as deductions for medical expenses, student loan interest and certain moving expenses, that Republicans included less out of ideology than a desire to simplify the tax code ― and a need for money. The House bill cuts $3 trillion in taxes on businesses and individuals, and replaces half of that lost revenue through the elimination of various deductions. Among the items on the chopping block are $38 billion in what are known as “private activity bonds,” or tax-free local government loans for private enterprises that serve the public interest, like airports, waste disposal facilities and affordable housing. The Senate tax bill doesn’t have the same provision, which is one of the smaller differences between the two bills. Ultimately, if tax reform is going to reach the president’s desk, the House and Senate will have to agree on one bill, most likely a compromise version hammered out in a conference committee with lawmakers from each chamber. “We’re gonna go to conference and we’ll see what comes out of there,” Kelly said. The House tax bill nominally preserves the Low Income Housing Tax Credit, a $9 billion subsidy for the rehabilitation and construction of affordable housing. Some of the credits are paired with tax-free government bonds and issued by states to developers, which can then sell the tax credits to investors in order to obtain additional financing for qualified projects. However, without the bonds, which the House bill would kill, the credit would be useless for some projects. “This will have a severe impact on the construction and preservation of affordable homes throughout the country,” Diane Yentel, president of the National Low Income Housing Coalition, said in a statement earlier this month. Novagradac, an accounting and consulting firm that specializes in real estate, estimated that the bill would result in about 80,000 fewer new and rehabilitated affordable housing units per year. The housing credit has plenty of critics. The libertarian Cato Institute argues the subsidy mainly benefits developers and investors. “The program has complex administration, is prone to abuse, and produces costly low-income housing,” Cato’s Chris Edwards and Vanessa Brown Calderwrote earlier this month. An investigation by NPR and Frontlinefound that the program creates fewer affordable units and at greater costthan it did 20 years ago. The impact of losing the subsidy on housing policy is probably dwarfed by another big change in both the Senate and House versions of tax reform. Both billsessentially guta deduction that allows homeowners to reduce their taxable income by the amount they pay in interest on their mortgages. The mortgage interest deduction, along with deductions for state and local taxes, are tax expenditures worth more than $100 billion annually ― making them the largest plank of U.S. housing policy in terms of dollars, by far. Eliminating the mortgage subsidy would knock home prices down 10 percent, according to a study commissioned earlier this year by the National Association of Realtors, which opposes the tax plan. While the loss of private activity bonds may reduce affordable housing, the loss of the mortgage interest deductioncould make housing more affordable across the board. Diana McIver, another Texas developer, said she’s afraid she’ll lose financing for a proposed senior-living complex in Austin. She has asked the investor and the bond issuer to try to speed up a closing that had been planned for early next year.